One of the first gifts I gave my husband was a 15 foot Grumman aluminum canoe. We weren’t married at the time but I wanted to give him something that said, “I get you and I want to share your interests”. I already knew how much he liked boats, especially the non-motorized variety. He had learned to paddle canoes while attending, and later working as a youth leader, at Boy Scout camps. So when I discovered a coupon on the back of a package of Uncle Ben’s Rice that was good for $150 dollars off the purchase price of a canoe, I figured it was an offer too good to pass up. I drove to one of the few sporting goods stores in our area that sold the designated canoes, verified that the coupon was in fact valid and made the purchase. I also had to buy a kit that contained four foam blocks and straps so that I could tie it to the top of my van to get it home, something I hadn’t thought about ahead of time. I don’t think he could have been any more surprised and delighted when I presented it to him as we celebrated Christmas in 1980. It did not matter that there was a dearth of lakes and rivers near our Southern California high desert community where we could launch the new boat. We were happy to drive the twenty or thirty miles to paddle around Lake Elizabeth or the Littlerock Reservoir. If we were able to get away for a couple of days, the Colorado River was a fun place not only to practice our paddling skills but also to learn about canoe camping. We would pack a few clothes, some dried backpacking food, sleeping bags and a tent and float/paddle down the river for a few hours before discovering a private cove or sandy beach where we could make camp for the night. It was around this time that we first became interested in the Boundary Waters Canoe Area(BWCA). I had an older cousin who had made several trips to this wilderness that encompasses more than a million acres located within the Superior National Forest in Northeastern Minnesota. He told us that the area had seemingly unlimited ponds, rivers and lakes that fed into one another yet most were restricted to use by human powered vessels. It sounded perfect. So much so that we decided to take our honeymoon there. Our little Grumman didn’t make the trip with us, as we decided to use an outfitter so that we didn’t have to haul the boat and all our gear half way across the country. 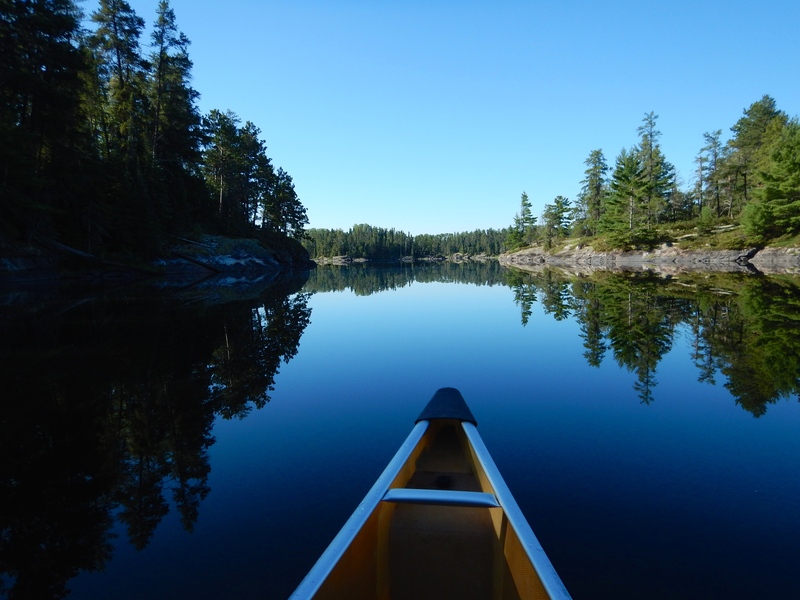 But we were not disappointed in the beauty and solitude that we found in the BWCA. We have returned twice, once with our son and daughter when they were teenagers and most recently with another couple just a couple of weeks ago. We hope that there will be yet another Boundary Waters adventure in our future. A week of paddling and camping in such a remote and beautiful place takes planning and a certain level of fitness but is well worth the effort. More than 30 years have passed since our first encounter with the BWCA and we continue to be in awe of this special place. This entry was tagged Boundary Waters Canoe Area, BWCA, Canoe, Canoe Camping, Grumman Canoe, Minnesota, Paddling. Bookmark the permalink.